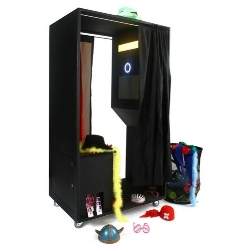 Get information on our affordable photo booth rental packages now. Say Cheese Photo Booths is here to take your party to the next level. Ready to learn more about our photo booth rental packages and which one is a great fit for your event? Let us help you plan a great event with the addition of a photo booth! We make the process as smooth as possible for you and even offer free delivery in the Austin, TX area. You can quickly check out our different photo booths and see what’s included. Looking for extra flare, props, or a custom backdrop? Let us know so we can help you create what you are looking for! Click on the photo booth option below to see more about it’s package. Contact us today for a quote. See some amazing add-ons you can add to your booth. And don't worry, we travel with lots of fun props whether you are having a wedding, hosting a corporate event, or having a BBQ at home.